As a marketer, generating quality leads for your brand is always on your mind—it’s a constant search for a more effective way to reach new audiences, and generate leads that are more likely to convert. However, according to recent studies, marketers don’t seem to be making much headway in this direction. 80% of marketers feel that their lead generation efforts are only slightly or somewhat effective. To understand the reasons for this, it’s necessary to look at the current process and identify what can be done better. Usually, lead generation happens through a form on a web page. An offer is promoted on different channels, and then interested users land on the form, and fill it out to claim their offer. While this works, and also gives exposure to your websites, there’s one main issue. It needs the user to leave the social network that they’re on to fill the form out. This is even more of an issue because over 96% of users access Facebook, one of the largest networks, through mobile devices. There’s only one good solution to this: hosting a form and collecting information from your audience on the platform they’re already on, without them having to leave it. Facebook lead ads can help you do exactly that. A Facebook lead ad is a type of ad that you can run on your Facebook ad account. The main advantage of using Facebook lead ads is that instead of sending your audience to a different page, where they’ll need to fill out their details, you can let them do it from within the channel. This will help you capture information about the lead from Facebook, and also improve the number of leads you get, because of the reduced effort required by your audience. It’s much easier for your them because Facebook prefills the form with the contact information that users have already submitted to them. This makes the whole process a lot simpler for the user, as they can now access your offers with just a few taps. Ultimately though, a Facebook lead ad is most useful as a means to collect information about people who’re interested in your business. Another useful benefit of using Facebook lead ads is that the leads that you generate through it can be synced directly to your CRM, or can be downloaded as a CSV file. This makes following up a lot simpler, and that’s essential to closing deals. 2. Choose Lead Generation as your objective, and then give your campaign a name. 3. Choose your brand’s business page. Click View Terms and then agree to the Facebook lead ads terms and conditions, after you’ve read them. 4. Set up the targeting settings for your ad. Facebook’s targeting options are really powerful. You can get granular and customize the target audience by location, age, gender, language, and many other target settings. You’ll also be able to see the total size of the audience you’ll reach, on the right side of your screen. 5. After you set up targeting, you can also choose the placements for your ad. Placements refer to the different places where your ad can be shown. You can ask Facebook to automatically place your ads where they’re more likely to perform best, or you can customize the placements yourself. However, we recommend you leave this to Facebook. 6. Once you’ve selected your audience and the ad placement, you can customize your budget for the ad. This can be done in two ways. Daily represents the average amount of money you want to spend per day on your ad. Lifetime represents the total amount of money you want to spend on that particular ad. You can also choose the start and end date for your ads here. 7. Choose an ad layout format from the options on the next screen, and upload your media. You can choose to do a carousel, an image, a video, or a slideshow. 8. Now it’s time to set up and customize the form for your lead ad. Add your headline, body copy, and a call to action. Try to make everything as specific as possible, so that your audience knows exactly what to expect. Form type: You can either select More Volume or Higher Intent. More Volume is quicker and easier to fill out, and must be chosen if you want to the form to be completed by as many people as possible. Higher Intent adds an extra step, where your audience will have to review and confirm the info before they submit it to you. Intro: Use this section to explain why people should fill out your form. Questions: There are two types of questions you can choose—standard questions (such as name, phone number, email address) and custom questions. You can use custom questions to ask any additional information that your business may need. Thank You Screen: This screen will appear after the form is submitted. You can customize the message that appears here. Review your ad, and then publish it. That’s it! Your lead ad has been created. Now you know how to set up your lead ad, but that isn’t enough for success. You’ll be competing for attention with all the other content that the audience you’re targeting are seeing in their feeds. This means that you’ll need to know how to optimize your lead ad perfectly so that your audience can actually see it and click on it. You’re going to be competing with a lot of other content, so it only makes sense that your ad be visually appealing, in order to catch attention. Make sure that your creatives are colorful, captivating, and interesting in some way. While you do that, also ensure that your visuals aren’t random and removed from the offer that you’re making. Your visuals should complement the copy, and be easily relatable to the offer you’re making to your audience. Again, you need to keep in mind that your ad will be competing with a lot of other content. To get the attention of your target audience, you need to write an intriguing copy. Try to incentivize your audience to click on your ad. This is easier to do if you have a clear idea about who your target audience is. Are they closer to the top of the marketing funnel, or are they closer to the bottom? Depending on your answer, you can offer information, discounts, trial periods, and more. Facebook says that context cards are optional, but it’s highly recommended that you use them. The context card is essentially the step between your potential lead clicking on the ad, and filling the form itself. Here, you get to explain why they should do it. When it comes to context cards, try to keep your copy as concise as possible. You’ll need to explain who you are, what you offer, and why whoever is on the screen should actually give you their information to you. If crafted well, adding context cards can be very persuasive to your audience. Accessing your leads through Facebook is a manual process. You’ll need to have admin access to download the leads off your page. Download new leads: You’ll be able to download all the new leads you’ve gained since the last time you downloaded leads. Download by date range: With this option, you’ll be able to download the leads generated within a particular time frame. In both cases, your leads will be downloaded as a CSV file. An important thing to note is that Facebook doesn’t keep the leads for more than 90 days. Even if you choose the Lifetime option while downloading by date range, you’ll only be able to see the leads generated over the last 90 days. So, it’s advisable that you download your leads regularly so that you don’t miss out on any of them. Another way to access your leads is to sync your Facebook business page with a social media management tool that’s integrated with Facebook lead ads. 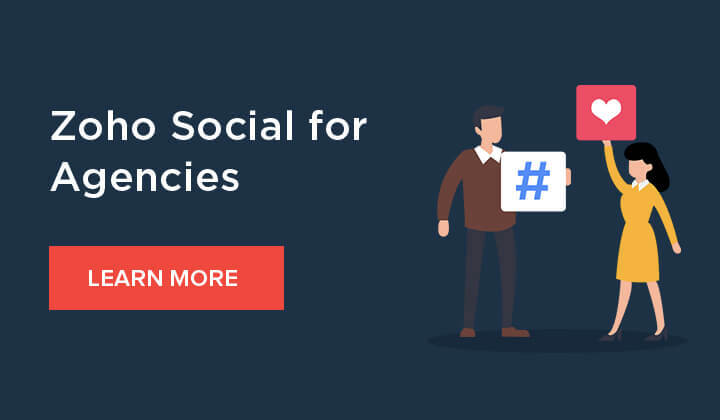 When connected, tools like Zoho Social will automatically update the leads as they’re generated, so you don’t have to go through the manual process every time. Another added advantage is that some of these tools can also be synced to your brand’s CRM. For instance, if you integrate Zoho Social with your Zoho CRM account, you’ll be able to push the leads that you capture directly onto the CRM platform. With this integration, you’ll also be able to set automation rules, so that anyone who even likes or comments on your ad can also be added to your CRM as a lead. When you’re running an ad on social media, one of the things you’ll want to do is to measure the return on the investment that you’re making. Measuring ROI for ads is a problem that marketers have had for a long time. Thankfully, Facebook allows you to integrate your lead ads with a CRM, so that you’ll be able to track the leads till the end. If you’re able to track the lead ads till the point of sales, it becomes a lot simpler for you to measure your ROI. You’ll have both the amount you spent on the lead ad, as well as the amount of sales that you’ve effected through leads generated from these ads as well. Simply calculate the profit that you’ve made, and then use it to calulate your ROI percentage. Now, you’ll be able to measure objectively how effective your lead ad campaigns are (in real-time! ), and if necessary, make changes to the ad if the results aren’t satisfactory enough. If you use Zoho Social to track your ads, you’ll also have access to CRM Reports (if you’ve integrated Zoho Social with Zoho CRM). From here, you’ll be able to measure the ROI for your lead ads as a whole, or even the ROI for specific lead ad campaigns that you’re running. Facebook lead ads are a powerful tool to connect you with the right set of leads for your business. By keeping the form within Facebook, you can reduce a lot of friction, and the fact that the information is prefilled makes it even simpler for your audience to express their interest in you. We hope the tips we shared here will help you make the most out of your lead ads campaigns. That’s it from us for today—if there’s something that you’d like to discuss further, please let us know in the comments below, and we’ll get back to you ASAP! Content writer at Zoho Social, stand up comedian, and lover of dogs. I read a lot.